On July 8, 2014, WilmerHale achieved a significant victory for a pro bono client and domestic violence victim in a case described by the Second Circuit as involving "novel and significant issues" of "first impression" under the Hague Convention on the Civil Aspects of International Child Abduction. The appeal followed the team's successful bench trial in the Southern District of New York in January 2013. The client and her husband resided in Italy and mutually agreed to move to the United States to seek effective treatment for their severely autistic son. After her husband attacked the client in front of their children, she then reported him to the police. Her husband then returned to Italy, and sued her under the Hague Convention, claiming that the client had illegally abducted their children from Italy. On April 19, 2013, the District Court denied the husband's petition for return of the children without prejudice to renewal, on the grounds that the autistic son would face a "grave risk of harm" if returned to Italy since it would significantly disrupt and impair his development. In particular, the district identified the significant lack of resources in Italy for autistic children in comparison to the United States. The Second Circuit in a lengthy opinion affirmed the District Court's denial of the husband's petition, and amended the judgment to denial with prejudice, thereby ruling resoundingly in favor of the client's position. 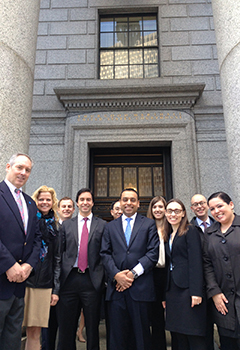 Partner Sanket Bulsara led the victory and shared with the New York Law Journal, "We're very pleased with the result. It allows our client to remain in the country and for her severely autistic child to receive treatment necessary for his well-being." The full team included Counsel Jacob Press; Senior Associate Tamar Kaplan-Marans; and Associates Maria Banda, Jing-Li Yu, and Musetta Durkee. In addition, a number of WilmerHale attorneys out of the firm's New York office were indispensable in helping the team navigate the appellate briefing and prepping for the oral argument. These individuals include Partners Noah Levine and David Lesser; Counsel Alan Schoenfeld and Jason Hirsch; Senior Associates Michael Gottesman and Adriel Cepeda Derieux; and Associate Ari Savitzky.